Last year for my personal Lenten practice, instead of “giving something up” I chose to “do something extra.” For me, that entailed committing to spend 5-10 minutes a day contemplating the crucifix, with the added dimension that I searched for a new cross each day. It made for a profoundly “spiritual” Lenten journey, because the time of contemplation would often take me outside of myself, considering the crosses of others, or perhaps considering the people who worked in a building topped by a cross. Did they think about that cross each day? What made me notice it on a particular day? How does that particular cross make a difference in my life on this particular day? 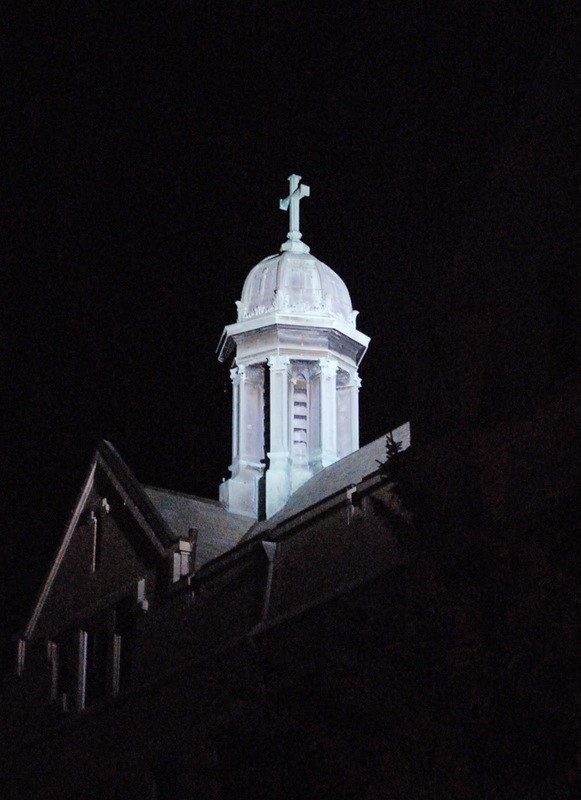 Studying at the seminary and living on the Catholic campus of Seton Hall University, frankly, it was easy to encounter a cross. Part way through my Lenten project, I encountered a few strange days where I found multiple crosses; what should I do? Which one would I contemplate on future day? The reality of that contemplation meant that I might actually be contemplating a particular cross over several days before it became my focal point, and that made the journey more important than the destination. I have noticed these past few weeks, however, that you don't need to be living on a seminary campus to find a cross; they are all around us, in images and in the people we encounter shouldering their own cross. Perhaps we are invited to be Simon of Cyrene and help another carry their cross for a time. This Lenten season of 2015 begins next week, with Ash Wednesday opening our time to prepare for the Easter season; but Lent is not just about getting ready for Easter. It is more powerfully about getting our lives in order with God, so that we might be able to celebrate as Easter people all year long. I plan this year to once again find a cross each day to contemplate, and I invite readers of this blog to join me. I am taking this journey into cyberspace, too, and have created a Facebook group titled “Forty Crosses.” Each day, I will post a picture of a cross that I have encountered, and before which I will spend my contemplative time. As you will see, some of these crosses will be pictures from the past, recalling places, events, or people who were with me when a particular cross may have been encountered in Ireland, or Israel, South Orange, Moorestown or Freehold. I invite you to consider joining me on this virtual journey for the next few weeks; the group is open to all, and you can feel free to upload your own crosses and reflections in the comment fields. I look forward to adding your intentions to mine, to have many of us join together in a journey of faith toward that ultimate Cross of Love, found only in Jesus Christ, our Savior, our Lord, our Brother.